Contains the Following: Publicity Shot, MP3 of “You Can’t Tell Me I’m Dying”, Publicity Poster & Bulletin Insert. For any other needed materials please contact our office by clicking here. 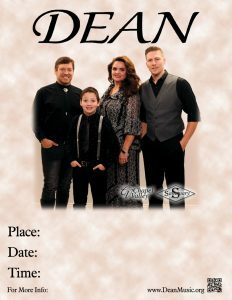 Copyright © 2019 Dean Family Music. All Rights Reserved.